Tahbes - an acronym for "Technisch en Algemeen Handelsbureau Brokmeier en Steegers" was a Dutch camera company, founded by J. B. Brokmeier and a colleague called Steegers in 1945. They were based in Kon. Willhelminalaan, Voorburg, near The Hague. The company lasted until 1957. 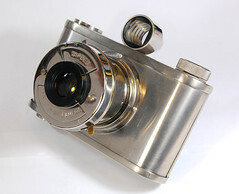 Synchro Unpainted, shiny metal-bodied camera with simple lens and flash-synchronised 'T'-and-'M' shutter on telescoping lens-tube; unusual Albada finder. Synchrona Similar to the Synchro, but with body covering, three-speed shutter and three apertures. Populair: Painted metal body. Otherwise similar to the Synchro, but with a simple folding frame-finder and no flash attachment or synchronisation. 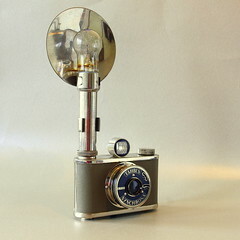 ↑ Synchro-Camera set by Hans Kerensky at Flickr. ↑ Populair offered for sale as Ebay item 182266741136, September 2016. This page was last edited on 5 September 2016, at 21:35.